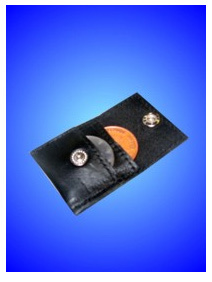 With the popularity of Hold’Em Poker exploding around the world, there has never been a better time to protect yourself from card cheats just waiting to take your money. In 2006, the World Series of Poker in Las Vegas drew an astounding 8773 contestants, with the winner walking away with a cool $12 million in cash. Whether you are a casual card player or a casino pit boss, this invaluable DVD teaches you how to survive in the shark-infested waters of the gambling world. Learn 60 techniques that are among the closely-guarded secrets of the card-cheating underworld! 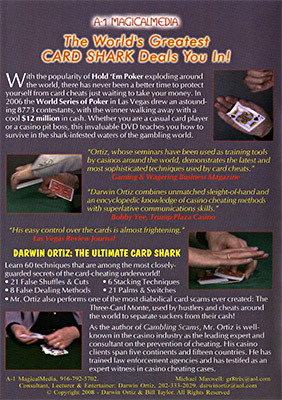 Mr Ortiz also performs one of the most diabolical card scams ever created: The Three-Card Monte, used by hustlers and cheats around the world to separate suckers from their cash! As the author of Gambling Scams, Mr. Ortiz is well-known in the casino industry as the leading expert and consultant on the prevention of cheating. His casino clients span five continents and fifteen countries. He has trained law enforcement agencies and has testified as an expert witness in casino cheating cases. Simply enter your details below and we will send you an e-mail when “Darwin Ortiz On Card Cheating by Darwin Ortiz - DVD” is available to ship!